Imagine you just started a new job and are leading marketing for a small or newer ecommerce business (or alternatively you are the marketing analyst of the department). Before you start your marketing efforts ƒyou are tasked with defining a few ecommerce KPIs for tracking the success of your marketing campaigns. The only tracking tool you are using is Google Analytics. Sounds scary right? With no starting points to begin with this sounds like a huge and complex venture as there are so many potential KPIs to choose. In addition you are probably scared that as you don’t know an immediate answer, people will soon start asking how somebody like you was hired to lead marketing (or be an analyst respectively). And as such not long until you get fired or replaced by somebody else. 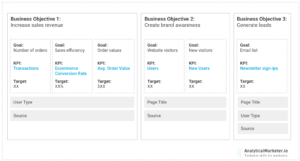 So what if you had a concrete KPIs framework to follow for ecommerce marketing. You would know exactly which marketing efforts work and what to focus on. All leading to skyrocketing sales. That’s what this guide is for. Step-by-step it will show you how to systematically develop a ecommerce KPIs framework directly derived from your business objectives. No other tool besides Google Analytics will be necessary for this. At the end of this article you’ll also find a done-for-you custom report template, which you can instantly add to Google Analytics in order to use your new KPI framework. In case you can’t wait and already want to work along. Get instant access to the custom report here. This guide and framework relies heavily on the work from Avinash Kaushik and is adjusted for an ecommerce context. Be sure to check out his blog, if you haven’t. One of the reasons why setting up a marketing ecommerce KPIs framework can be so overwhelming is that there are hundreds of metrics to choose from. E.g. should you focus on bounce rate or clicks? Are conversions the only metric to look at? Or are others equally important? In this guide you will reduce the large number of metrics you could look at, while focusing only on those, which are really important for your ecommerce business. Acquisition: How will users be acquired? Behavior: What should the users do on the website? Outcome: What’s the final desired result you want to achieve? Step one is to identify the business objectives of your company. Why does it actually exist? 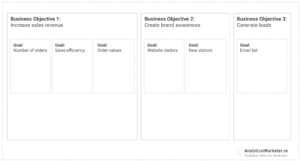 Step two is to identify goals for each business objective. Think of goals as steps to take to reach the objectives. Step three is to define the key performance indicators. So basically metrics that help you understand how you are doing. 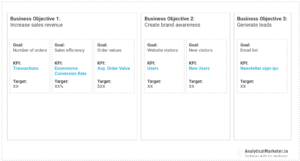 Step four is to identify targets for each KPI, indicating, if you are succeeding or failing. Step five is to identify segments of people / behavior / outcomes that can be analyzed further. Step 1 – Define the business objectives. Most ecommerce businesses have three objectives in common: They want to grow and as such increase their sales revenue. They want their brand to become more well known and doing so build brand awareness. And last but not least they to want build an audience or more specifically an email list, which they can nurture. Obviously not all of those objectives must be relevant for you and you can decide to use only part of below metrics. However those objectives are usually the common denominator for the majority of smaller or newer ecommerce businesses. Goals are basically the specific levers you have to pull to accomplish your business objectives. As you want to increase the absolute number of sales as well as the efficiency of your sales process we will work with three different goals here. As a first goal we want to increase the number of orders, second we want to improve your conversion rate in order to convert the website traffic more efficiently and as a last we want to increase your average order value in order to rise customer value. We want to get your brand more well known and more people visiting your store. As such we will set two goals here. First we want to get more visitors overall to your website and second more specifically we want to increase the number of new website visitors. Last but not least we want to build an engaged audience with an email list that you can nurture. Therefore your last goal here is to increase newsletter sign-ups through the website blog. For each objective we will need metrics, which tell us how you are doing against each objective and goals respectively. Those metrics are called key performance indicators (KPIs). As we want to increase number of sales, sale efficiency and average order value we will also define your KPI’s accordingly. Therefore the metrics to focus on here are Transactions, Avg. Order Value and Ecommerce Conversion Rate. Not only do we want more visitors coming to your website, which is why we track number of total Users as one KPI but we specifically want new visitors. Ergo the second KPI is number of New Users. As your goal is to build an audience or email list, we will be tracking the number of newsletter Sign-Ups as a KPI here. It is important to set targets for each KPIs upfront in order to have indicators of success or failure. Failing to set those will make it impossible to determine, if your marketing campaign was successful or not. It is not possible to generalize what the targets should be for you business specifically. E.g. increasing sales by 100 orders could be huge marketing success for an online store just starting out but a marketing campaign failure for a store, which makes millions in revenue already. There are three main options to determine targets. Either you look at historical performance, e.g. “we had 100 orders at this point last year, which is why we want to have 120 this year”. Or, if you don’t have historical data you can look at ways to substitute that data. E.g. is there a competitor, which sales you can estimate? Or numbers from a similar product you have been selling before? Last option is to ask internal or external people. E.g. internally you could ask people, who have been working there before you such as management or the founders. If those don’t exist or aren’t available, try to find external sources as for example your clients (for validation), consultants or other ecommerce people to approximate sales and other metrics. I know this step might seem intimidating. But setting any target is better than no target at all. If you still don’t have a clue how to set your targets, try to set a number, that if when reached won’t make you feel too bad. The more experience you get the better your targets well be. As such just set a number to start with and revise it as time goes by and you get more data to base it on. There are probably a few people, who will stop thinking about their marketing analytics framework after step 3 and as such not set any targets. But I bet that the majority will wrap it up after step 4 the latest and will not define any meaningful segments. Segments can be anything from the traffic sources, your user behavior onsite, the kind of users attracted. Basically anything you can segment your KPI metric reports with and which will tell you more on how to achieve your business objectives. Segmentation is the only way to give your KPIs a meaningful sense and make them actionable. E.g. it is nice to know that 30% of your visitors are new users, however this insight becomes truly actionable, when you know that 100% of those come from PPC advertising. Source – Where did the users come from? Social Media, referral, organic, etc.? This segment is relevant for all your KPIs. As such you could ask, which sources drive the most sales or where most new users come from. As somebody working in marketing this will probably one of the most important segmentations for you in order to decide, which marketing channels to focus on. User Type – Should you focus on new or existing users? E.g. you can track which group accounts for most revenue or which source refers the most new users. You can easily focus your marketing efforts accordingly on either group by looking at this segmentation. As you can see segmentation is the final step to make your KPIs actionable. You will know exactly what type of traffic source, content, etc performs the best and where you should focus. Feel free to add your own segments, depending on what makes most sense for you. That’s it! We went through a structured approach to determine which KPIs to use, derived directly from the business objectives. We kept in mind the acquisition of customers (user metrics), the behavior they should show on the site (newsletter signups, conversion rate) as well as the outcome we want (conversions and transaction value), while having a relatively low overall number of metrics to track. 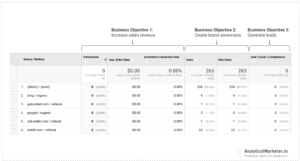 As promised this is a custom report template, which you can add directly to your Google Analytics account in order to track above six metrics. Please keep in mind that you have to set up ecommerce tracking correctly to use it and make sure you are tracking newsletter sign-ups via event tracking (I used Goal 3 in the template). Furthermore this is a Google Sheets template, which you can use to track actuals vs. target numbers for your KPIs for the next months.